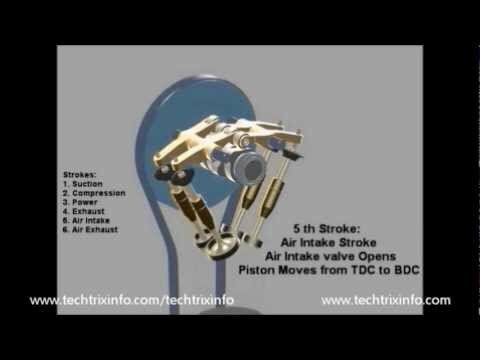 Lets learn about the newly patented six stroke engine in this article. Mr. Chanayil Cleetus Anil from India develops this engine. The animation clearly shows how the six-stroke engine operation with the valve movements. After a lot of hardships and hard work, Mr. Anil has developed this particular six stroke engine. He is still working on a project to improve it better further. In this project, he is trying to mix the four-stroke engine and six-stroke engine for higher efficiency. This engine can be called as a multicycle engine. We will be soon posting an article on this. If this article was useful, please consider sharing this in social media. If you have any doubt about this particular model of six stroke engine. Please feel free to drop your comments below.